With readings from Julian of Norwich, Julia Ward Howe and the Gospel according to John 17:20-26, our Mothers’ Day was infused by Sophia! I am indebted to John Shelby Spong’s “The Fourth Gospel: Tales of a Jewish Mystic and John Philip Newell’s “Rebirthing of God: Christianity’s Struggle for New Beginnings” for insights beyond my own imaginings. Again, our Lord showed himself to me, this time more glorious than I had seen him before. I learned that our soul will never find rest until it comes to the fullness of Christ’s joy. I AM the one most honoured. I AM the one you enjoy. I AM the one you serve. I AM the one you long for. I AM the one you desire. I AM the one you yearn for. I AM the one who is everything. I AM the one whom the holy church preaches and teaches. There were so many words, I couldn’t understand them all. But the joy I had in listening to those words went far beyond anything I could think or desire. I won’t try to explain them, but, as the grace of God gives you love and understanding, you will know what God means. Arise, all women who have hearts, whether your baptism be that of water or tears! Say firmly: “We will not have great questions decided by irrelevant agencies. Let them solemnly take counsel with each other as to the means whereby the great human family can live in peace, each bearing after his own time the sacred impress, not of Caesars but of God. Over the years I’ve met lots of people from Belfast who measure love in bags of sugar. As near as I can tell this loving conversation has something to do with sugar’s ability to make all things sweet and the fact that over the generations sugar was in short supply because most people simply couldn’t afford to buy sugar. I’ve also been told that during and after the two World Wars sugar was rationed, so a big bag of sugar was more sugar than most people ever saw. Sugar was a much sought after satisfying treat, that was essential to a happy life, so measuring love in bags of sugar is something that to this day, my great-nieces and nephews still learn from their elders. But these days even children know that sugar isn’t what it used to be. We all know too well the dangers of a big bag of sugar. Sugar in large quantities is bad for us! Loving someone today, often means limiting their sugar intake. I suspect that expressing love in terms of bags of sugar will soon go the way of Ring-around-the-rosie…while children still sing it they have no idea that it is all about the black plague that saw millions of children fall to their death…. Love measured in bags of sugar, like packets full of posey, is a thing of the past…vaguely remembered by only a few. Given a few generations and our ways of expressing things, like language changes over time. Take for example our way of expressing the Divine, the Source of All that IS and all that Ever Shall be, the names we give to the ONE who is responsible for our Creation, the ONE in whom we live and move and have our being, the ONE we call God, has been known by many names over the centuries. The earliest name for the ONE credited with our Creation is quite simply “El”…”El” is if you will, the generic name for “God” El a word found in both the Ancient Sumerian and Canaanite languages translates as, god. In the ancient manuscripts of what we know call the Hebrew Scriptures, but our parents called the Old Testament, the earliest expression used for the God we were raised to worship is, El Shaddai, which is all too often incorrectly translated into English as God Almighty, but which quite literally translates into english as “breasted one” or the more accurate translation, “She Who Has Breasts”. Elohim, often incorrectly translated as LORD, is the feminine plural word for “majesty”. El Shekinah, is the Ancient Hebrew expression for the presence of God, which quite literally means, “she who dwells among us”. Chokhma is another Ancient Hebrew expression which was used to express the feminine spirit of the Divine which was later translated in to Greek as Sophia, we translate as Wisdom. Ruach is the Ancient Hebrew way of expressing the very essence of God, in the Scriptures it is used in Genesis as the Ruach Elohim, which literally translates as the feminine, majestic “breath, wind, or spirit of God, which we now express as the Holy Spirit. All these feminine ways of expressing what is meant by the word God, were supplemented with images of God as a mother eagle, a mother bear, a mother hen, a birthing mother, a suckling mother, a comforting mother, a woman in labour, and yes even as a woman looking for her lost coin; all these feminine ways of expressing the very nature of our God, were lost to us for generations. Slowly, we are rediscovering these old ways of understanding the nature of our God who is LOVE. LOVE infinitely sweeter than any old bag of sugar. So, today as we read the words put into the mouth of Jesus by the anonymous gospel-storyteller that we call John, in which Jesus insists that he and God are ONE, I can’t help wondering about the ways in which this expression has changed over time. Our Gospel text this morning comes from what is commonly called Jesus’ farewell discourse or the High Priestly Prayer. The story-teller we call John puts Jesus in the garden at Gethsemane just before the events that happen on what we call Good Friday. In this discourse Jesus prays for his followers, “I pray also for those who will believe in me through their message, that all may be one, as you, Abba, are in me and I in you; I pray that they may be one in us, so that the world may believe that you sent me. I have given them the glory you gave me that they may be one, as we are one—I in them, you in me—that they may be made perfect in unity. Then the world will know that you sent me, and that you loved them as you loved me. That we may be ONE…so often this fervent prayer has been interpreted as a plea for unity. What our friend Jack Spong is trying to open us up to is the way in which Jesus followers understood Jesus to be opening humanity up to a new understanding of what it means to be human. A way of being in the world that understands our origins in the ONE, our existence as ONE, and our passage into the ONE. This radical expression of our humanity as being ONE with the divine, or seeing divinity in humanity changes everything. But most importantly, it changes the way in which we relate to God. God is no longer expressed as some far off distant super-natural being, but rather as an intimate, integral, being, in which we live and move and have our being. 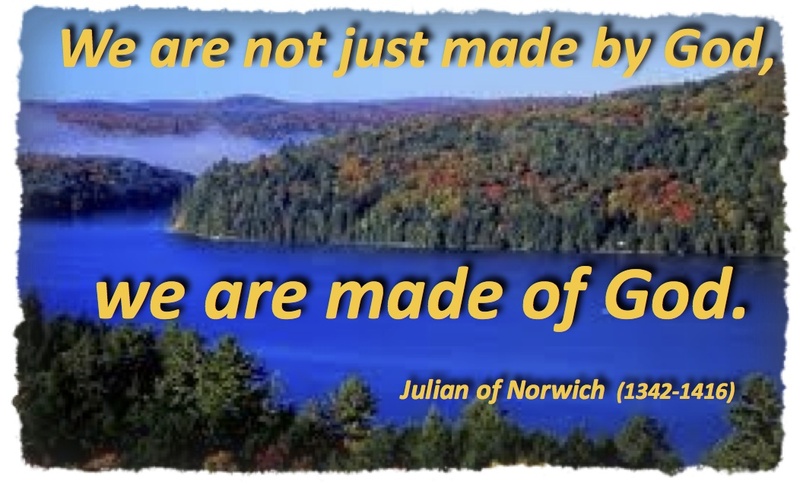 We are not just made by God, we are made of God. Think about it. You and I are made of God. When we begin to see our fellow human beings as ONE with God, this has profound implications for how we relate to one another. For as much as you do unto the least of these you do unto me. Jesus is teaching a whole new way of being in the world. Jesus knew this intimacy, this ONEness with God, and sought to instil the wisdom of this Unity, this divinity that finds expression in humanity, into his followers so that all would know the truth of our ONEness in the unity that finds expression in each of us. The implications for how we live together are enormous. Bags and bags of sugar could not even begin to sweeten life in the way our ONEness with the LOVE that we call God offers to those who embrace this unity. God is not an external, distant entity; God is a life we enter, a love we share, the ground in which we are rooted. The call of Christ is not into religion, but into a new mystical oneness. There is rather an incredible new insight into the meaning of life. We are not fallen; we are simply incomplete. We do not need to be rescued, but to experience the power of an all-embracing love. Our call is not to be forgiven or even to be redeemed; it is to step beyond our limits into a new understanding of what it means to be human. It is to move from a status of self-consciousness to a realization that we share in a universal consciousness. John’s rendition of Jesus’ message is that the essence of life is discovered when one is free to give life away, that love is known in the act of loving and that the call of human life is to be all that each of us can be and then to be an agent of empowering others to be all that they can be.” Jack Spong, like Julian before him, like the anonymous gospel-storyteller we call John, see in Jesus the expression of the ONEness of which we are made. How much do I love you? Well lets just say that once, I spoke like a child, I thought like a child. But when I became an adult, I put the ways of childhood behind me. Where once a bag of sugar, was enough to express my love, now I am beginning to understand that I was not just created by love, I am created of love, a love beyond my ability to imagine, a love in which I live and move and have my being. The love that we call God, El Shaddai, the breasted one, Elohim, majesty, El Shekenia, She Who Dwells Among us, Sohpia, Wisdom, Mother of us all, Yahweh, I will be who I will be. The I AM, in which I live and move and have my being. And just as, if not more importantly, the I AM in which all humanity lives and moves and has being. The implications of this way of expressing Divinity and understanding humanity are as immense as the LOVE that makes us ONE. Amen. This entry was posted in Adult Education, Evolutionary Christianity, Home, Progressive Theology, SERMONS, Theology and tagged John 17:20-26, John Philip Newell sermon, John Shelby Spong sermon, Julian of Norwich, Progressive Christian Easter 7C sermon, progressive christian mothers day sermon, progressive christianity, progressive theology, spirituality by Rev. Dawn Hutchings. Bookmark the permalink.